In my solution, I created a simple order look up system that uses an AWS Lambda function to look up order information from an Amazon DynamoDB table. My customers can call the phone number assigned to my Amazon Connect instance, and are prompted to enter their order number when the call is answered. I created a simple Amazon Connect contact flow that takes the order number the customer enters, and invokes the Lambda function for the simple order system to look up that order number in my order database in Amazon DynamoDB. Using the data retrieved from the DynamoDB table, I create a message in a text-to-speech block that tells the customer whether their package has shipped, the estimated delivery date, and which carrier it shipped with. The customer is then presented with an option to be transferred to the that carrier to get more information. If they choose Yes by pressing 1, they are transferred and the contact flow ends. Would you like to get more information about this package from $.External.carrier? Press 1 for yes, or 2 to end this call. value I looked up in DynamoDB earlier. Scenario 2: Resuming the contact flow after transfer. 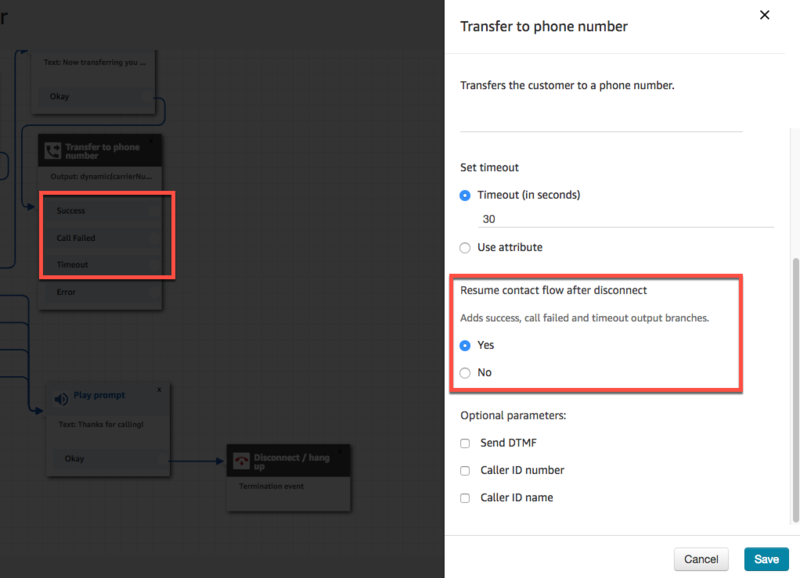 In this scenario, I return the customer to the Amazon Connect contact flow, in this case to for a post-call survey. I use the survey to make sure that the carrier resolved their issue, and if not, connect the customer to an agent for additional assistance. conversation with the shipping carrier is completed, the customer is returned to Amazon Connect and the contact flow resumes after the Transfer to phone number block. Using these new options, I can specify actions to take when those scenarios happen while the customer is still on the line. In this case, if the carrier didn’t resolve the issue for the customer, or the call did not complete successfully, I offer to let them speak to an agent. You can see in the updated contact flow how I check whether the carrier solved the problem in the Get customer input block. If the issue is resolved, I ask them to fill out a post-call survey in the Store customer input block. If the carrier did not resolve the issue, I use a Transfer to queue block, which places the caller in a queue for an agent. Continuing to extend my solution, I want to transfer the customer to the carrier, but not make them enter their order number again. Since I know the tracking number, I can build an integration on top of the carrier’s order look up system, and then send DTMF tones on the customer’s behalf. When the customer is connected to the carrier, their tracking number has already been entered and the tracking information is retrieved and ready to provide to the customer. To do this, I added DTMF tones in our Transfer to phone number block. Using additional DTMF characters that are recognized by the carrier’s IVR order lookup system, such as using commas for pause, I can provide the correct values to the automated system. In my example, I used an AWS Lambda function to create the correct sequence of numbers and commas to interact with the carrier’s system, and saved that string as an attribute named “CarrierNumberWithTracking”. The attribute looks something like this when formatted: “18001234567,,,1,,,1,,,12345”. This example assumes that the automated system requests that you press 1 twice to get to the menu where you enter the tracking number (12345). 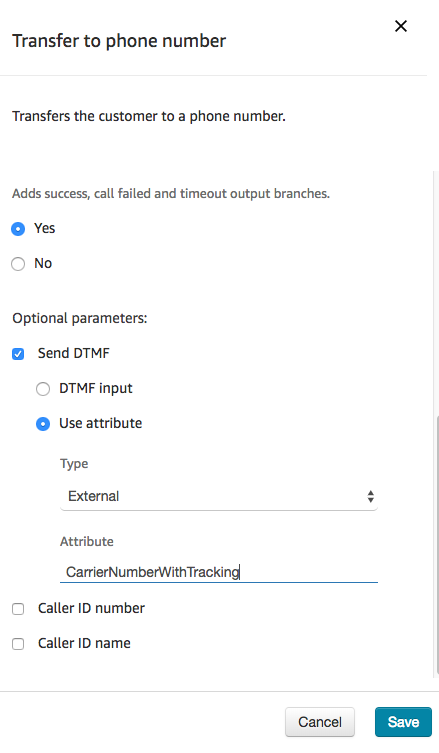 The customer doesn’t hear any of the DTMF tones or pauses, and is magically connected to the carrier with the tracking number already provided as though the customer had entered it. Feel free to give try out the demo I built for this article by calling: 1-203-689-7523. You can try order numbers 1111, 2222, or 3333. In my example, I don’t connect the call to carriers (since I don’t have real tracking numbers), and instead just play a prompt to simulate how it would be connected. This whole demo took me less than an hour to build, and hopefully highlights some of the simple and powerful experiences you can create with Amazon Connect. I found that I could easily automate one of the most common questions a business might have so that agents can focus on the tougher problems. 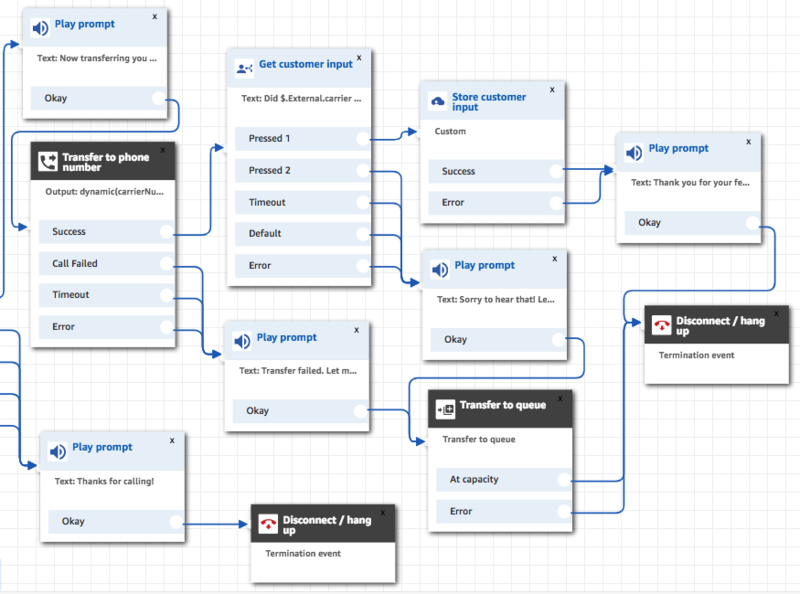 I hope these scenarios inspire you to build more cool automated scenarios for your business!